Drinking young Hunter Semillon is often unfun. It really is. You can appreciate the classic lines – ie lots of acidity – but otherwise it is like staring into a crystal ball and predicting greatness. 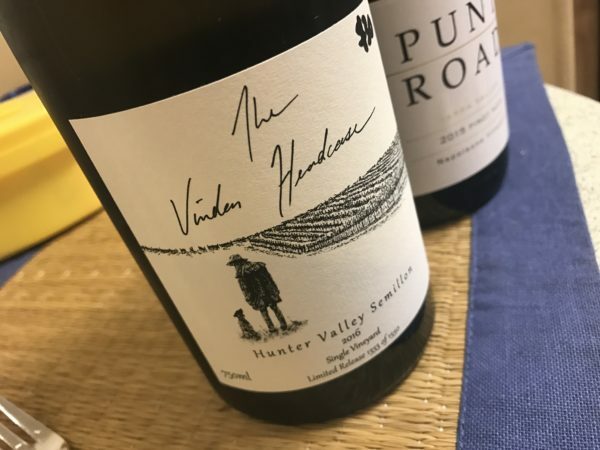 The Vinden Headcase is the label of Angus Vinden and Dan Binet, who between them have taken over the winemaking at Angus’ parent’s Vinden Estate property in the Hunter (Dan is also the Director/Winemaker at Ballabourneen). With this wine the pair are delving into classic Semillon territory, handpicking fruit from the revered Somerset Vineyard on Oakey Creek Road. This embyronic Sem is built for the long haul too. The style is all condensed around structure, so that ‘crystal ball view’ requires a knowledge of where a wine like this will end up – and it’s a good place. The nose is all green apples and lime, with a little blossom, the intensely, acid-shaped palate has just the barest suggestion of sweetness, but it’s fleeting. After that the finish is so long, and backed by an unwavering intensity that suggests a real superstar in the making. The acidity is almost too much for now though, which makes drinking it now something of a waste. You’ll need real patience. Damn it’s going to be good in five years though. Best drinking: 2021-2035. 18/20, 93/100+. 10%, $30. Would I buy it? Not much to lose here. I’d buy some for the cellar for sure. Andrew, have you tried many of the Hunter Sem’s from the 2016 vintage? I tried the the A.Thomas Braemore earlier in the year, it was a couple of weeks out of barrel and it looked good for such a young Sem. I’ve tried a few ’16 Sems now. Not the easiest vintage with lots of harvest rain (although it warmed up late). Sem, in particular, was hard hit with lots of disease pressure. That said, Hunter Sem is picked early and bloody resilient. Rare that it’s not a good year for Hunter Sem. Even the wet years – like 08 – produce good wines. That’s part of the joy. If there is one thing that sets this year apart, however, it is that the wines look a little bit leaner and more steely. Less approachable in their youth, but with high upside for longevity.